On this Victoria Day 100 years ago, Canadian & Punjabi mettle thrilled the Empire. In the spring of 1915, while the British 2nd Army continued the fight to defend Ypres in Belgium, the 1st British Army under Sir Douglas Haig began a co-operative assault with the French south of Ypres around Auber’s Ridge. The objective was nothing less than to remove the Germans from French soil. The first attack on May 9th was unsuccessful costing Haig 11,000 casualties. Less than a week later, he ordered another push. This time Canadian & Indian troops would join the 1st British Army at the Battle of Festubert. Following the 2nd Battle of Ypres, the battered Canadian Division had been rebuilt with new drafts having lost 6,000 of its 10,000 men. Festubert would be the next major action of the CEF. Here again, the Indian Corp and the 1st Canadian Division would fight as brothers-in-arms under 1 Flag for 1 King. In a reverse of Ypres the Indians would attack first on May 15th and the Canadians would renew the attack on May 18th. Lost amongst the carnage of 18th May, is a fantastic story of a band of men upholding the Izzat (honour) of an illustrious Sikh regiment with a display of courage typical of their ‘Martial Race’ reputation forged during the Victorian era. The story of the Sikhs in the British Indian Army included episodes such as Saragarhi, just a generation before, in which 21 besieged Sikh soldiers ( without a British Officer), on having been given the chance to surrender, rather than renege on the oath they had taken to protect the Crown, elected to fight to the death against 10,000 Afghan forces. The Khalsa regiment that stood firm on the North West Frontier that on that day in September 1897 was the 36th Sikhs, an all Sikh regiment. On the afternoon of May 18th 1915, this time on the Western Front, the regiment that would uphold the honour of the brotherhood of the Khalsa was the 15th Sikhs. Their British officer Lieutenant, John Smyth, was tasked with delivering 96 bombs to men stranded in a captured section of a German trench – to do it they had to cross 250 yards of no-man’s land and succeed where the fabled Highlanders had failed – the supply party of Scotsmen had all been killed or wounded before reaching halfway. When Smyth asked for volunteers, every Sikh stepped forward to face the murderous crossfire of German artillery and machine gun fire. Smyth chose 10 to form a bombing party. The first man, Sepoy Fatteh Singh, went down as soon as they emerged from a trench that provided cover for the first 50 yards. There on in, Sepoys Sucha Singh, Ujagar Singh , Sunder Singh , Sarain Singh , Sapooram Singh, Ganda Singh, Harnam Singh, Naik Mangle Singh fell one after the other as they navigated the macabre shell torn landscape of broken bodies and shattered trenches. By the time they were within 30 yards of their target there was only 1 man left, Lal Singh, and with him remained 1 of the 2 boxes the Sikhs had so valiantly lugged so far. With the stranded men of the forward company providing cover fire they finally reached the captured trench and delivered their life saving load. However the story of martyrdom had yet to be completed – Lal Singh would be shot through the head shortly after reaching the trench. For his gallantry Smyth who survived to the tell the tale, was awarded the Victoria Cross. Amongst the Sikhs Lance-Naik Mangal Singh received the Indian Order of Merit, and the others the Indian Distinguished Service Medal. 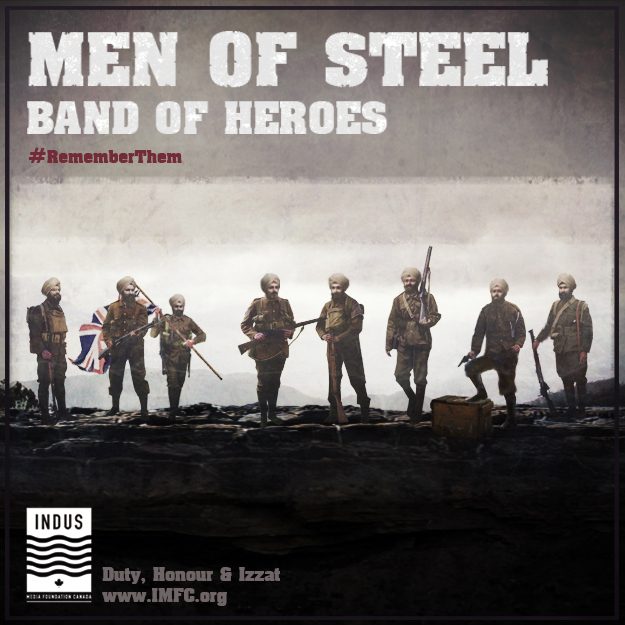 In total the Indian Army won 242 IOM’s and 625 IDSM’s in courageous actions in the field of battle on the Western Front ( over 9,000 gallantry decorations were won by the British Indian army throughout all WW1 theatres of War). 100 years ago, news of these heroics spread across the Empire with newspapers calling the band of ten Sikhs “Supermen’. We would like to think that word of these actions spurred on the Canadians on May 18th, as they fighting on the right flank of the Indians, renewed the attack on the German lines, launching several frontal assaults in the face of well entrenched machine guns. Again in mirroring the events of 2nd Ypres, when the Lahore Division was marched northwards to defend the Canadian line, this time the Canadians were marched southwards into a situation in which the Germans had all the advantages of terrain and firepower and could observe preparations for the assault. Hurled into the fighting with little artillery support, inadequate maps and little time for preparation the Canadians fought desperately for small gains over a week of fighting but ultimately proving the Canadians could attack , they achieved most of their objectives including the capture of the village of Festubert but at cost of 2,468 casualties. Since the 2nd Battle of Ypres less than a month earlier, the Canadian Division had suffered more than 8,500 casualties. These 2 inaugural battles (St Julien and Festubert) established the Canadians’ reputation as a formidable fighting force – we should be proud knowing we were right there fighting alongside them. As the world remembers its fallen, please share this post with your friends to join us in honouring our Punjabi forefathers, heroes who gave their lives for the freedoms and democracies we enjoy today.